From SOuthBaltimOre.com– The Baltimore City Planning Department’s Planning Commission voted unanimously to approve the 260-acre Sagamore Development Master Plan last evening. This follows the recommendation by the staff of the Planning Department to approve the plan. Images courtesy Jeff Totaro Photography. Southbmore.com – Under Armour’s newest office space, Building 37, converted the former Sam’s Club at the former Port Covington Shopping Center into a 170,000 sq. ft. work space for the company’s finance and IT department. Under Armour is calling the building Phase zero of its new approximately four million sq. ft. campus at the former waterfront shopping center. Under Armour plans four future phases at the 50-acre campus and unveiled its master plan yesterday at the Urban Design & Architecture Review Panel. Our friends over at SouthBmore.com have written a great round-up of the master plan forPort Covington. Read on for the details. -The Eds. 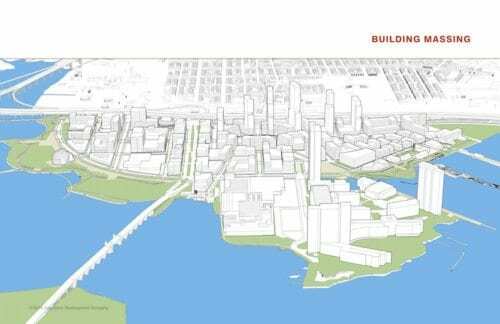 The team from Under Armour CEO Kevin Plank’s Sagamore Development and Elkus Manfredi Architects recently revealed the master plan for Port Covington, a 266-acre section of the South Baltimore peninsula south of I-95 that includes more than two miles of waterfront. Sagamore currently owns 161 acres in Port Covington from recent acquisitions, which it described as 85% of the private parcels. Sagamore envisions a 50-acre campus for Under Armour; 76 acres of mixed-use real estate development; 114 acres of public realm between parks, infrastructure, and open space; and, an existing 26 acre NGK-Locke, Inc. facility which Sagamore does not own.